This stunning softback catalogue produced by the Royal Academy features a number of Scottish printmaker Barbara Rae's much loved pieces. This impressive publication is the first fully illustrated monograph of painter and printmaker Barbara Rae RA, renowned for the bold use of colour in her striking abstract work. This special edition is accompanied by a print of Orgiva, available in a limited edition of 150. In 2015 painter and printmaker Barbara Rae followed in the footsteps of explorer Dr John Rae in a journey through Greenland. In this publication new works by the artist submerge the reader in the frozen landscape of the Arctic. Tagak Curley, Colin Greenslade, Duncan Macmillan, Tom Muir, Barbara Rae and Ian Ritchie. Icy jewel-like colours glow in this bold bangle, taking inspiration from Barbara Rae's journey to the Arctic in which she sailed past icebergs and polar bears. Icy jewel-like colours glow in this pair of earrings, taking inspiration from Barbara Rae's journey to the Arctic in which she sailed past icebergs and polar bears. Bold and dynamic, Royal Academician Barbara Rae's signature style has been translated from canvas to ceramic to create this highly decorative, one of kind platter. Using strong natural colours associated with seascapes, Rae has hand-painted this unique piece and added her signature to the reverse. This unique piece is available for collection from the RA Shop only. To produce this unique ceramic platter, award-winning artist Barbara Rae RA hand-painted pastel glazes onto pottery in one of Poole Pottery's signature shapes. Of the process, Rae has said "It's very peculiar working totally with pastel colours and trying to remember that it's going to turn out dark blue or black after firing in the kiln." This unique piece is available for collection from the RA Shop only. A spectrum of icy jewel-like colours glow in this reversible choker, taking inspiration from Barbara Rae's journey to the Arctic in which she sailed past icebergs and polar bears. With brushstrokes of colour encased in a two-sided acrylic pendant, this piece makes twice the statement of any other necklace. 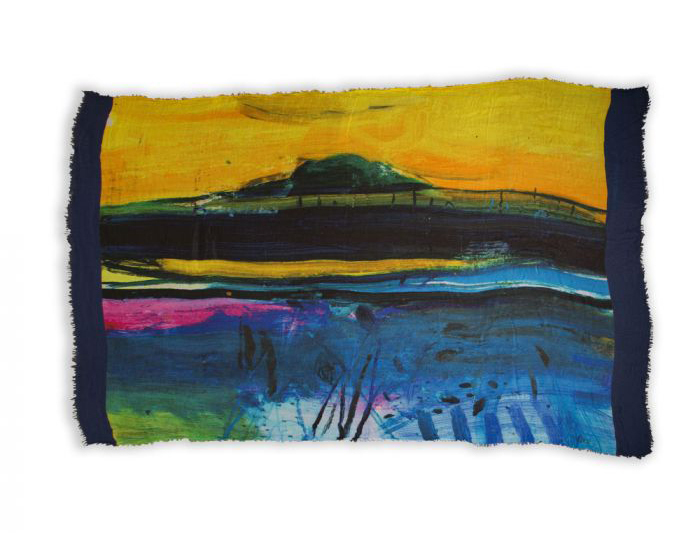 Featuring Barbara Rae's bold, contemporary artwork evoking the coastline, Ardmore Point, this beautiful scarf would make an eye-catching addition to any outfit. The wild coast is captured in this greetings card featuring the Achill Beach landscape by Barbara Rae RA.